It has become a tradition (in my head) for me to do a draw of tarot cards in order to gain some foresight into the direction that my spiritual journey may take in the coming year. Each year I leave the decision regarding the tarot deck and the layout to Fate. Fate never lets me down. Whichever of my guides is operating as Fate seems to allow me some miraculous information. What is the nature of my spirit guide? What is the guiding principle governing the year’s work? What will the outcome of the year’s work be? Each question appears to offer me the guidance to understand where I am headed and how I will be helped. If you haven’t tried doing such a layout for yourself then I highly recommend it. 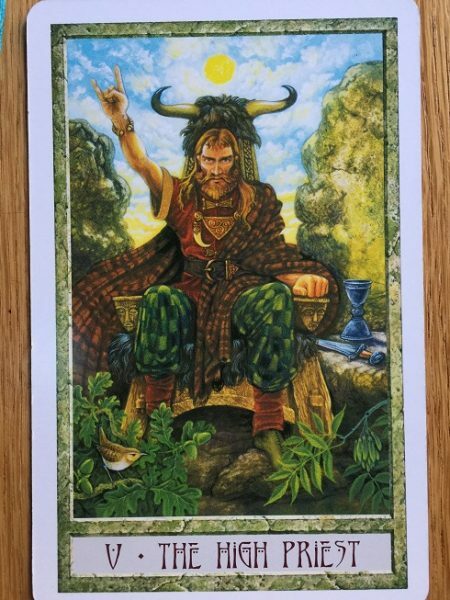 Often, after the first few points in the year you might forget to refer back to them, but then you might also find that when you do return to the reading that actually you will be astonished by how accurate the cards reflect what you’ve been doing. That is when you know that you’ve been fairly faithful to the year’s intentions. I’m expanding the Spirit In Nature meditation group and splitting it into new starters and an advanced group. I’m potentially doing some teaching with a group of new people for a project which will form part of a study on the benefits of natural meditation. I also have my Natural Meditation book which is near completion and ready for sending to a publisher. Finally, there is the expansion of the Bewildercamp spiritual weekend retreat project, which will have new facilities this year and hopefully attract more people to participate. 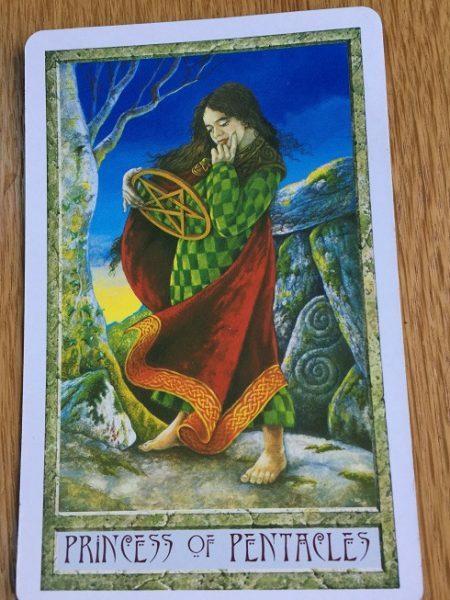 In this post I will cover the cards drawn for the first half of the year, from Imbolc to Summer Solstice. In the next post I will deal with the cards from Lammas to Winter Solstice. In the final post I will cover the three spiritual guidance cards. • The burial chamber – emergence into the world – new projects born into reality, conceived and then realised through study. INTERPRETATION: The Princess of Pentacles is telling me to study the heavens in order to inform the next stage of my spiritual journey. Specifically it is telling me to concentrate on Venus, and to understand this star’s significance and movement. This starting point will give me the basis upon which to begin to learn more star lore so that I can impart that knowledge into the Bewildercamp weekends, and to begin to link the advanced meditation group with the energy of stars during our deep meditations. In essence, this is going back to basic learning for me, such that I can take my existing projects further. • Reflection – focus is on the action and not on the wisdom hidden in plain sight. Turn attention to the thing you dare not face – the hard work of getting a book published for example. • Transformation (the otter chases the salmon – the pursuit of wisdom – Cerridwen chasing Gwion). Through making the effort you will find the reward and catch your prey. INTERPRETATION: By Spring I will reach a point where I have been prevaricating, perhaps even actively ignoring some important development work – a project which needs my attention and focus in order to make progress. Through an act of transformation I will be able to achieve this goal, obtain the wisdom associated with it, if I understand my relationship with Venus by this time. Perhaps a sacred site associated with Venus and water may help to make the breakthrough? INTERPRETATION: This will be the culmination of the work done with Venus. It will involve a peak power point where a special energy is created which may be related to or helped by Merlin. The timing of this will seem to relate to an event in the Taurus constellation, perhaps Venus moving into Taurus on 6th June? The High Priest is showing the end of a cycle through the resonance of the chequered pattern of his clothing which mirrors the same coloured patterned clothing of The Princess of Pentacles which appeared at Imbolc. 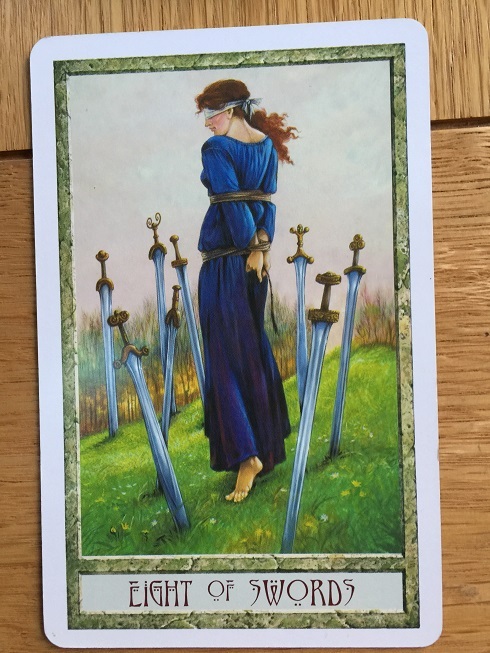 INTERPRETATION: I think the card offers the possibility of freedom from the constraints in place at this time. Once the restriction is understood then the huge energy available at this time of year should be sufficient to be able to break out of this situation. The lady is barefoot and retains a connection to the earth, and although her path out is dangerous, there are options in every direction. The very instruments which are constraining are also the things which could cut the cords and remove the blindfold. Something air related or related to the colour blue will indicate the way out. 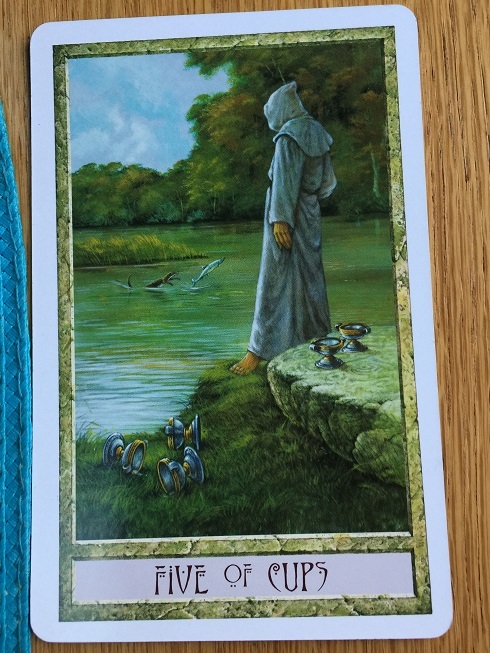 In the next instalment I will be looking at the remaining half of the year, and then will complete the reading with an interpretation of three guidance cards.